Once more into the breach, dear friends. One more thoroughly annoying example of why it is so important to test as many cousins as you can afford to test if you’re going to get into trying to use autosomal DNA to help in your genealogical research. In a nutshell, each of your parents has pairs of chromosomes but will only pass one of each to you. Before that happens, each pair the parent has gets mixed together and jumbled randomly so what you end up with may be more or less from any one ancestor. That’s why even brothers and sisters don’t have the same DNA: though each child gets 50% from each parent, each won’t get the same 50% as any other child. But hey… this was a pretty safe bet, right? Third cousins. Ninety percent. Nine out of ten. And, late last night, I got an email from another cousin — my first cousin, who like me is George’s third cousin (her mother and mine were sisters) — who said George had popped up as a match in her list at AncestryDNA. Now you can already see where this is going, right? George is not on my match list. 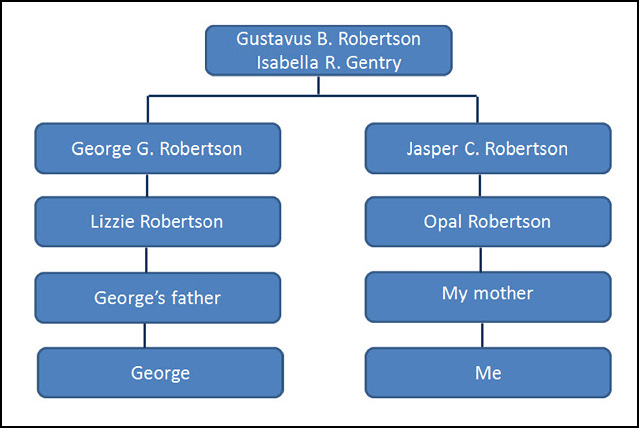 But all this means is that whatever genes George and our cousin both got from our Robertson second great grandparents didn’t make it through the recombination process that resulted in me. I’ve already arranged to have George’s results transferred to Family Tree DNA where we’ll be able to see exactly where those genes are (a feature lacking at AncestryDNA) that they have and I don’t. Still, it sure highlights why it is that — over and over — we’re told that the best advice for autosomal DNA testing is to test everybody you can afford to test. Ah! Now to convince these cousins to test, sponsor-paid offers on some. May I quote you, Judy? You sure can. Good luck in getting those cousins to say yes! Hi Judy, this is the first time I’ve heard you mention a Gentry ancestor. I heard through the grapevine you had Gentries and Cottrells (possibly married to each other???). I’ve been meaning to email you about them. I got a tree from Karin Corbeil, but I wasn’t sure exactly where my Gentries fit in with yours (or hers). I have Lucinda Gentry, born 12 Apr 1868 in Tennessee, dau of William T Gentry & Minerva J O’Neal. My cousin Kay Haden is also related to you via the Gentries and she said you are connected via Nicholas Gentry. Do you know if William T Gentry is descended from Nicholas? Thanks! The Cottrell and Gentry bloodlines don’t mix in my family until my grandparents (my grandfather was a Cottrell, my grandmother the descendant of the Gentry family). I don’t have William T. in my database at all, but there are a whole host of others who know the extended Gentry family much better than I do. Some places to start are the Journal of Gentry Genealogy and, of course, the various online databases and others who may descend from your William T. The Nicholas Gentry DNA is well-established by DNA testing so if you have any male descendant of William you can test, that will help a great deal. It’d be neat to be cousins, but… I can’t get us there with what I know. Thanks Judy. I tried the Journals but didn’t find anything. I will see what I can do with the DNA testing. There is a lot of mismatched information out there right now! Remember that depending on how far back it is, you may run into needing YDNA and not autosomal to prove your case, Ginger. My line was linked to Nicholas via YDNA. Thank you for the illumination. This is one reason why I have not yet done any genetic testing. First, the cost…secondly, I think I have had pretty good luck finding living cousins through other methods, i.e. reunion update questionnaires, land and probate docs, and referrals by others researching the same counties. Those in our extended family are not likely to run out & do DNA testing…but it would be interesting to discover which part of Africa my husband’s family originated. There are lots of situations where DNA evidence just isn’t necessary, Debra, and in those cases it’s sure not going to be my first choice. But for all those brick wall situations? It can’t hurt (not matching George doesn’t prove we’re not related, it just proves we don’t have enough genes in common for the testing company to say we are related), it may help, and I actually have not only found cousins I couldn’t have found any other way but have helped confirm theories I might not have been able to confirm any other way. This is the only circumstance where I can say, “I got the good genes! You sure did, and thank heavens you tested too! Can you imagine if we hadn’t tested as many people as we have???? Oh and don’t forget… you also got the skinny genes from your Dad. I got the … um … not-skinny genes from my German grandmother! I don’t think one person would think of you inheriting any “fat” genes from anybody. Now TALL genes, on the other hand! Tall genes, for sure. I’ll grant you that. I’ve had my Y-DNA tested to 111 markers and a full mtDNA sequence. I like statistics so when I compared how many results FTDNA had compared to the world population I realized we have very, very, very FEW samples to compare to. WE NEED MORE TESTING! Without more testing our results will always be skewed. So I’ve paid for another test (FTDNA “Family Finder” autosomal) to add my bits to the database. You are so right about the numbers, Tim. If you added up everyone who’s ever tested anywhere with any company at any time, it’s still a drop in the population bucket! Your post is extremely helpful! I did not realize the odds dropped so sharply during the trip from third to fourth cousins in autosomal DNA. And you make a fine point that just because the odds are with you, that doesn’t mean you will have a sure match. I’ve got to study all this more carefully . . . thanks for the help! It is pretty amazing how it works, isn’t it, Mariann? And the odds do drop quickly. The odds drop quickly, but that’s more than offset by the number of people so in your match list you will have many more 5th cousins than 4th, etc. That can give you the mistaken impression that the odds are good for having a match with any particular 5th cousin. While the odds for matching any particular 5th cousin are small, there are so many of them that several will show up. Which ones show up is just a matter of chance. Exactly correct, and very frustrating for folks with brick walls two, three, four generations back. I have a very large number of fifth or more distant cousin matches… and very little chance of ever identifying the common ancestors because of records destruction. Judy, this is the best explanation of the use of autosomal DNA that I have read. Thank you. My friend Mary and I are 6th cousins once removed on my father’s side and both avid genealogists. Can you imagine how thrilled we were to find that we actually share some DNA? The real surprise was finding out that Mary shared some (different) DNA with my mother as well. My parents are not related but Mary’s father’s family is from the same region as my mother’s family although we haven’t identified a paper match yet. Fascinating stuff! That’s really neat, Yvette. Good luck in finding the link on your mother’s side! I had the same thing happen to me at 23andMe. We did not match with the threshold that 23andMe has, but we had lots of common relatives on the Relative Finder. I could tell that we were related through my dad because of the paper trails. And with both of us having a large percentage of Cajun/Acadian ancestry, you would think that we would definitely match. When my dad got tested, he didn’t match the cousin either. I decided to upload my RAW data to GEDmatch.com to see what would happen. It ended up that we do have matching segments, though they are around 3cM in size and 23andMe doesn’t show these. Maybe this could be an option for you and your cousin. I haven’t read all of your posts to know if you have an opinion of that website, but I thought I’d mention it. Ordinarily I wouldn’t put much store in 3cM matches, but with the paper trail and common DNA relatives, I decided to accept this as evidence of kinship. Thanks, Van, and yes I have written about Gedmatch before (see Gedmatch: a DNA geek’s dream site, posted 12 Aug 2013). And this cousin and I do share a number of segments, including one 7.2 cM segment — just below the limit for being reported as an FTDNA match.